The days are getting ever-so-slightly longer and the angle of the sunlight is inspiring spring longings (my Black-Capped Chickadee burst into song a couple frozen mornings ago as I was filling the bird bath with clean water). But green is still a couple months away. And I still have many more memories of Ecuador to share. After traveling over the continental divide we finally arrived at Cabanas San Isidro and spent the rest of our time there. Surrounded by birds on the grounds, we had several trails to explore on the property and beyond, as San Isidro is situated between two national parks. Green Jays were predictably around the dining hall making raucous comments. The Black-eared Hemispingus above was seen only once. Just barely. We likely would never have seen the White-bellied Antbird above if we had not visited a location where insects have been collected for its consumption. This is becoming a more common practice as more people travel to see these birds. Every bird loves a free meal. Frequently seen birds above: Montane Woodcreeper, Russet-backed Oropendola and Mountain Wren, were still challenging to capture. Identifying flycatchers is always challenging, but I love the variety and the personalities of each individual. On the left is a Pale-edged Flycatcher, and the bird on the right is a Marble-faced Bristle-tyrant, which is a lot of name for a small bird. Invariably there were Rufous-Collared Sparrows everywhere, which made them nearly ignorable, except for the fact that their marvelous Towhee-like song which I have recorded and inserted right under the pictures made me think that if House Sparrows had an equally beautiful vocalization maybe we would tolerate their numbers better. Rufous-Collared Sparrows are not an invasive species in Ecuador but their numbers are reminiscent of House Sparrows in my neighborhood. Come to think of it, even when we were in the cities, I don’t think we had one House Sparrow the entire trip. It was wonderful to see this Masked Trogon well, although I did not want to startle him by trying to move to a better angle so his image wouldn’t be bisected by the wire he was sitting on. It was even harder to get a Crested Quetzal, let alone one that would turn around all the way and face me. Still, she sat there long enough, I really can’t complain. Not a lot of tanagers from this day, but I was able to capture this Blue-Gray. The Bluish Flowerpiercer above was another species we added to this group. I’m sure there are times it looks bluer in better light. The Cinnamon Flycatcher above was looking for insects outside my back porch. My cabin was amazing. A few photos below. There were plenty of hummers around the dining hall where several feeders hung from the veranda. I will likely have more feeder pictures to post but for the time being I cannot resist sharing this Sparkling Violetear in a moment of repose. I will be back again with more from Ecuador. It’s hard to go back to my normal life even after sitting here composing a blog post about this place. Goose Lake Natural Area and the Hebron Trail, in McHenry County up by the Wisconsin border, was on my list of places to revisit this year and I was so happy to be accompanied by my friend Susan who had a Yellow-Headed Blackbird in her sights as a species to add to her life list. I checked with ebird and confirmed the blackbirds had been seen in late July last year, so there was a good chance of seeing them still. These photos are from last Sunday. 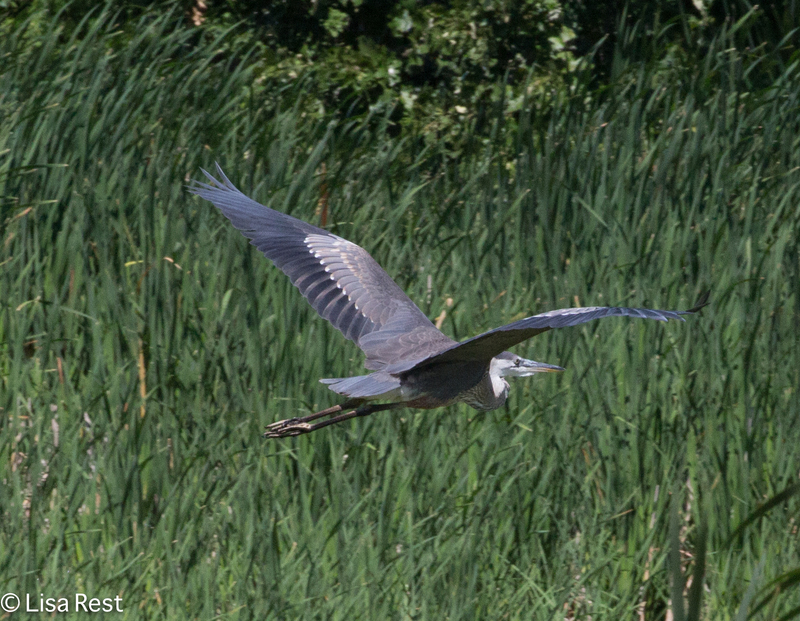 On the way up, Susan spotted two Sandhill Cranes walking near a fence by the road. And a juvenile Song Sparrow. The Yellow-Headed Blackbirds were suddenly in view in numbers and they dominated the landscape. Susan definitely added this bird to her life list. We did not see an Black Terns, a species that also breeds here. Perhaps we were too late in the day or the season. At some point a flock of Canada Geese flew over. Below, flying Yellow-Headed and Red-Winged Blackbirds. One particular Tree Swallow kept flying around a distinctive dead tree, tempting me to try to capture it. The tree it perched on is a favorite stopping place. Not at all confusing were the distinctive sounds of singing Marsh Wrens, but it was getting hard to find one sitting up until we encountered this one close to a platform overlooking the marsh. Some of its song is at the link below (you will also hear Common Yellowthroat singing first). The water level was exceptionally high, but the area was not flooded as were other parts of the county. We saw many Pied-Billed Grebes with young, although they were at quite a distance. Nice to see a Monarch Butterfly. Would have been nicer to see several. I’m intrigued by the yellow flowering plant on the upper right, which I do not recognize, and the Purple Prairie Clover below it, which I later realized is also blooming in my front yard. Imagine that. It was nice to see a Ruby-Throated Hummingbird, even in lousy lighting, and a robin with food for young. We met a very nice man who lives nearby and checks out the marsh regularly. He used to teach environmental science so he was full of good information and stories. He’s holding the crayfish below which he rescued from the gravel path. He encouraged us to come back at different times of the year. I think we should take him up on it. More Yellow-Headed Blackbird photos. Missing are the distinctive white patches on the wings of adult males, which makes me think these are all juveniles. The little trio below leaves me stumped as to who the sparrow is, again. Since all juvenile sparrows tend to be on the streaky side no matter how they wind up as adults, I think this one has the look of a juvenile Field Sparrow but I’m not going to bet on it. Summer simmers on. I’ll be back soon. Sorry I haven’t been back to the page sooner but I’ve been down with a nasty cold that doesn’t seem to want to go away. Yet I could speak above a squeak this morning, so I will have to take that as a sign of improvement. Here is a quick post from part of a visit to Michigan with friends over the Memorial Day Weekend. Specifically, these photographs were taken at the Kirtland’s Warbler Restoration Project in Iosco County. We visited this site on the morning of the 27th. 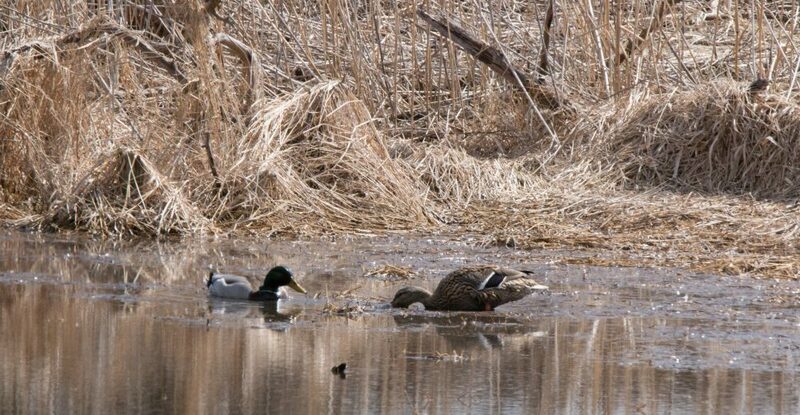 The Kirtland’s breeding population is established well enough now at this location to warrant offering tours by the AuSable Valley Audubon Society. Thanks so much to Sam Burckhardt and the Chicago Ornithological Society for another memorable trip. Kirtland’s Warblers are a fire-dependent species, breeding only in young Jack Pine forests. They winter in the Bahamas. 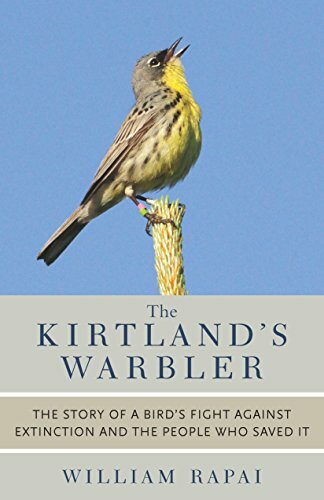 Their fascinating story was chronicled a few years ago by William Rapai, the author of The Kirtland’s Warbler: The Story of a Bird’s Fight Against Extinction and the People Who Saved It. There were also several Nashville Warblers on territory and although they were a bit elusive I did manage to obtain a few distant photos of this one and a clip of him singing as well. To confuse the issue his song is overlapping the Vesper Sparrow’s, which is also below. Perhaps the unexpected treat for me was a singing Vesper Sparrow. I have not seen these guys too often. A clip of the Vesper Sparrow’s song is below the pictures which were taken at an unfortunate distance. It can be distinguished from the Nashville’s bubbly song by the three introductory notes all at the same pitch. Perhaps the birds most seen over the weekend were the huge flocks of non-breeding Canada Geese. This is only a small sampling of one flock passing overhead. Below, a female Orchard Oriole on the left (you have to click on the picture and still look hard to find her, she is so well-camouflaged) and a male Orchard Oriole on the right. Brown Thrashers were singing quite a bit too, now I’m sorry didn’t bother to record one. Below is one very cooperative bird. Now the challenge is to get through another busy weekend and a lot more photographs (and, I hope, a lot less facial tissue). I am trying to stay optimistic! Please have faith, I shall return, lots to share with you.